At Omino we mainly offer two types of services: analysis, i.e. assessment, audit and evaluations; and development, i.e. leadership development, executive coaching and management team development. We use scientific methods in order to assure consistency and reliability at the same time as we put our clients’ needs first, being flexible and tailoring our offerings to our clients’ challenges. Analysis is the core of Omino’s client offerings and what we are experts at. Our ability to get a deeper understanding of people, teams and organizations, allows our clients to take informed decisions in regards to selection, recruitment or organizational change. Our analyses will be the foundation that gives clients peace of mind in difficult decisions and permits them to focus on their business. Every step of our Omino analysis is intelligently constructed to provide accurate advice and promote development. 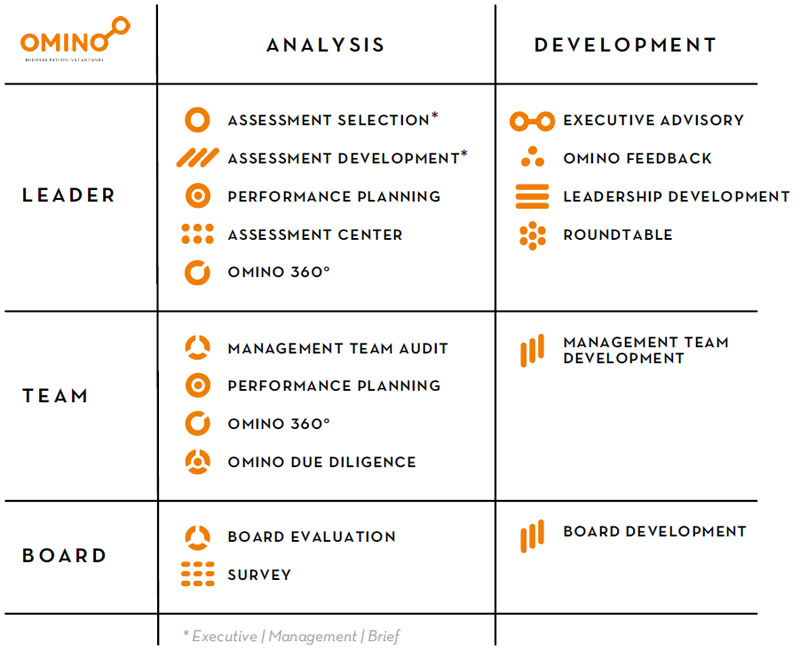 The thorough and structured steps of an Omino analysis allow us to provide tailored solutions focusing on sustainable development. This means that we do not only give you the intelligence concerning needed actions, we support you all the way from analysis to change. Our services combine scientific methods with close to business interventions, which provide the optimal foundation for change and growth. We offer services within analysis and development tailored for leaders, teams and boards.